As we were out of our normal room this week we had a visit from the poet AnnWilson. She led the session creating some fantastic poems and stories based around the images we had seen last week at the Graham Sutherland Exhibition. Ann played a number of word games so that we did not feel under pressure and the results were brilliant. We will be putting the poems and stories together along with images we made inspired by the exhibition. The Thursday group had loads of things going on. Making Papier Mache creatures, pom poms, making bag and many other personal projects people were working on or finishing off. Julie and Sally went onto the local mental health ward to run our regular creative session. They were making small wire creatures and covering them with coloured paper to produce interesting effects. After the visit to the Abbot Hall Gallery exhibition of Graham Sutherland landscapes we decided to try a Kendal landscape in his style. We took elements and shapes from the town and put them together in a hopefully Sutherland like way. A really good session here. We started by looking at images by Scottie Wilson, then we created our own in the style of. Because many of the group have mobility problems effecting their hands we had to simplify the activity a lot to take account of this. One man had been a professional artist but said this was the first time he had picked up a pencil since his stroke. He then went on to produce lovely small portrait sketches of people in the group! The WellArt group visited the new Abbot Hall Gallery exhibition “Exultant Strageness: Graham Sutherland Landscapes.”. The images gave the group many ideas around taking elements of the local landscape and using them in a more abstract way. Anne-Marie the Engagement Officer gave us a brilliant guided tour explaining the work and life of the artist. We were accompanied by Ann a poet who was looking at the themes in the exhibition to use as inspiration for written pieces. An inspiring exhibition all round. on the go. From rag rugging to modelling and beyond. Jo, July and Sue G led the way. Jo and July were on the ward making cards using a range of media, along with a bit of painting too. 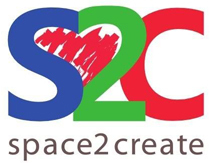 Please note that Space2Create will have a summer break of two weeks between Monday 29th July and Monday 12th August. On Friday 19th July the WellArt group is visiting the new Graham Sutherland exhibition at Abbot Hall Gallery with a guided tour by the Engagement Officer Anne-Marie. The group will also be accompanied by a poet, Ann, who will be doing some work with the group the following week to write a response to the exhibition with the aim of producing an illustrated booklet.